Adaptation of Takashi Noguchi's manga, which itself adapts Baku Yumemakura's supernatural romance novel. The original novel is about a 12th-century man named Minamoto no Yoshitsune (Kurou). 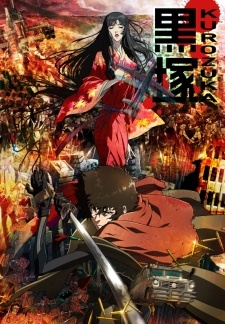 Kurou flees into the mountains after losing to his brother Minamoto no Yoritomo, the first Shogun to rule all of Japan. History records that he committed suicide, but instead, Kurou meets a strange, beautiful woman named Kuromitsu in her mountain hermitage. Eventually, Kurou falls in love with Kuromitsu, but then realizes she conceals a dark secret. He learns that he is unable to die and continues to live for a thousand years as Japan evolves into a future society. Watch Kurozuka Episodes Online at Animegg.org. Kurozuka is available in High Definition only through Animegg.org. Choose an episode below and start watching Kurozuka in Subbed & Dubbed HD now.